Old Giuseppe Garibaldi knew a thing or two about fighting, having led his red shirts to victory in the struggle for control of Naples in 1860. A central figure in the creation of the modern state he may have been, but the old warhorse could perhaps be accused of being a touch melodramatic in his culinary inspired call to arms. Pasta does; however, appear to inspire flights of fancy in some of the most sober of people. At one time, Italian scholars would regale their students with tales of how the 13th-century Venetian explorer Marco Polo returned from China bearing the first examples of pasta, but a succession of historians have rubbished this assertion, pointing to reference from Romans times that point to the legions munching on an early form of lasagne sheets. The Estruscans, too, are cited as early exponents of it. Claim and counter-claim should not come as any great surprise. Pasta has been so successful at establishing itself as a staple of diets worldwide that it was inevitable everyone would want to claim the recognition, even retrospectively.A great deal of that success in terms of the dried variety comes from the relatively long shelf life. This meant that it was easily transportable, a fact borne out by Genovese records of its movement by ship in the second half of the 13th century.The consensus appears to be that if anyone is going to take the credit for introducing the Italians to pasta, it is the Arabs when they invaded Sicily around the 8th century. The region's abundance of durum wheat provided plenty of flour for making the stuff, it was easily transported and the mercantile trade contributed greatly to its delights being introduced to new audiences in the southern Mediterranean. 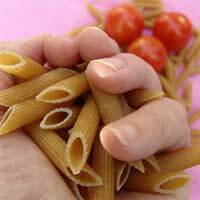 In common with that other great wheat product, bread, for centuries pasta was eaten dry using the hands. It wasn't until it met its perfect match that the fork began to enter the equation. And the name of pasta's new-found leading lady? None other than the rather generously proportioned tomato whose first appearance in pasta recipes is cited around the early part of the 19th century. The introduction of machinery capable of producing dried pasta on a large scale together with the product's aforementioned durability in terms of shelf-life and ease of transport greatly accelerated its popularity. Maccheroni and spaghetti constituted its image in the popular mind but in Italy itself a vast range of different shapes suitable for different sauces were developed and adapted across the regions resulting in the diverse forms in which pasta can be found in shops around the globe today. It is manufactured in many countries but it goes without saying that the best is still sourced from the country that popularised it, due in the main because the Italians established rules and regulations that governed the quality of the finished product. In hindsight Garibaldi was being a little modest in his claim that maccheroni would unite his own country because in any one of its many forms, pasta has in fact unified the eating habits of people across the world in the 21st century.